Caterers prepare food to serve at a customer’s location or rented facility for parties, weddings, meetings, receptions, etc. Food is usually prepared off site and transported to the event location. 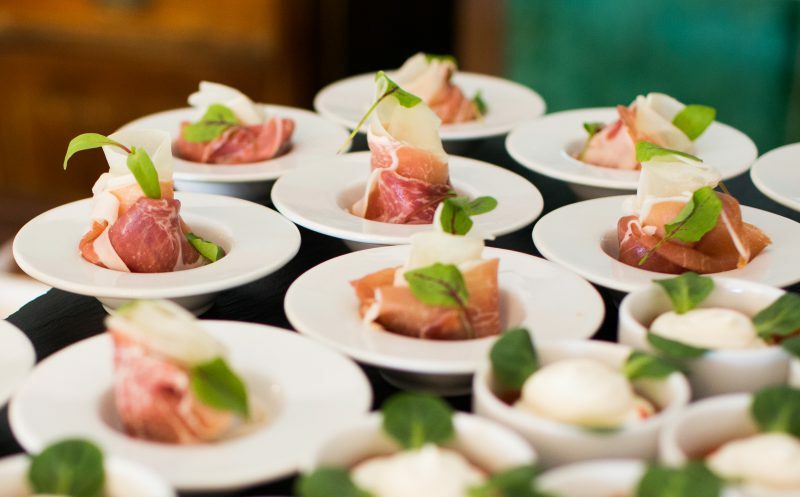 Caterers often provide more than just food, such as rental of linen and dishes, chairs and tables, entertainment, wait staff, music, decorations, and alcoholic beverages, with or without a bartender. are high due to cooking. While cooking may be limited to ovens, there may also be grills and deep fat fryers. These must have automatic fire extinguishing protection, hoods and filters. There should be fuel shut offs and adequate hand-held fire extinguishers. The kitchen must be kept clean and grease free to prevent fire spread. Spoilage exposure is high as a small fire or a power outage of even moderate duration can cause all fresh and frozen goods to be condemned as unfit for consumption or sale. Business income and extra expenses can be minimized if there is an alternative location to prepare food if there is a loss. are high as operations are dependent on the availability of cooking and refrigeration equipment. are dependent on the money and stock available to steal. If the restaurant uses expensive cuts of meat or provides alcohol, theft of stock could be a problem. If the cash receipts are high, both employee dishonesty and holdup are concerns that must be addressed. There must be consistent rules on cash drawer management and consistent job assignments. Money should be regularly stripped from the cash drawer and irregular drops made to the bank during the day if there is substantial accumulation. Criminal background checks are recommended for any employee handling money. are from employee dishonesty and loss of money and securities. Employee dishonesty is controlled through background screening of employees, inventory monitoring, control of the cash register, and disciplined controls. All ordering, billing and disbursements must be handled as separate duties. Regular audits must be conducted. includes accounts receivable from customers, food and equipment of the insured transported and used off site, and valuable papers and records for suppliers. The insured will need a special floater to accommodate all the items that must be transported for the catering. on premises is minimal as there is little or no public access. The primary liability exposures are off-premises at locations that are generally not familiar to either guest or employee. The owner should review the area before the event to determine the hazards involved. Servers must be well trained in the handling of hot food. Seating areas must be reviewed regularly for spills to reduce the exposure to slips and falls. Temperatures of hot beverages must be limited to reduce injuries due to scalding. All employees must be instructed in proper customer handling, including how to deal with disgruntled or overly enthusiastic customers. There should be a contract between the caterer and the client to prevent disputes. There must also be a contract between the caterer and the owner of the event facility so that each party’s responsibilities are clearly understood. is higher than in an on-site eating establishment because of the time delay between food preparation and serving. Maintaining proper temperatures during transport is vital. Injuries can result from food poisoning, contamination and allergic reactions. Monitoring the quality of food received, posting of ingredients, and maintaining proper storage temperature can reduce this exposure. Quality control requires limits on the length of time food may stay in the buffet area. depends on the amount and type of alcohol served and the adherence to strict policies on who can be served and how much they can be served. Employees who serve alcohol should complete training courses in recognizing intoxication problems and dealing with customers. This can be a particular problem at private parties where there may be an open bar. An agreement must be in place with the contracted party as to how to control this exposure. is moderate due to the food being transported from the caterer’s premises to the event location. It is important to be aware of the distance, the expertise of the driver and the maintenance of the vehicles. While it is important to transport the food in a timely manner, there must be sufficient time provided for the safe transport of the food. MVRs and driving records should be obtained for all drivers. come from slips, falls, cuts, burns and heavy and awkward lifting, along with interactions with guests. The employees tend to be minimum wage and turnover may be high. Employees should be trained on the carrying of heavy dishes between the kitchen and the serving areas. Company incentives to encourage long-term employment are positive signs of management control.